A perennial hairless plant; the very long, white, cylindrical or tapering root produces a 2-3 foot high stem in the second year. The large basal leaves are lanceolate with scalloped edges; the stem leaves are much smaller, sessile, lanceolate, and serrate to entire. A panicle of numerous white flowers appears during June and July. The fruits are round pods on long, upright stalks. The root has a biting-hot taste. Native to southeastern Europe and western Asia, and occasionally found wild but usually cultivated in other parts of the world. Horseradish and chicory are used at the Passover seder as bitter herbs, commemorating the misery of the Jewish slaves in Egypt. This plant was introduced as a condiment in England in the 1600s, but according to an herbalist of the era, “only for country people and strong laboring men”. The diuretic properties of fresh horseradish make it useful for gouty and rheumatic problems and also bladder infections. For the latter, take 3-4 tbsp. a day of grated horseradish with wine vinegar and some grape sugar, (dextrose). For colitis and intestinal problems due to putrefaction, 15-20 drops of juice taken 3 times a day between meals will help. For catarrhal lung problems, coughs, and asthma, take horseradish combined with honey and raw sugar. Used to treat disorders of the renal system, kidney stones, and dropsy. 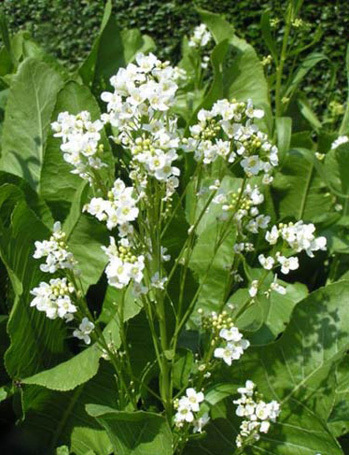 Externally, it is used as an irritant to stimulate blood flow; fresh horseradish can be made into a poultice, add a little cornstarch to the grated herb, for rheumatism, poultice for bronchitis, and into a bath additive for chilblains. Stimulates the appetite and acts as a tonic to the whole system. Has been useful in regenerating blood vessels, especially the arteries, and reduce the blood pressure. The freshly grated root, combined with vinegar or lemon juice, is used as a condiment with meat. It is also an ingredient in many sauces. Fresh root will not keep more than 3 months. Very pungent flavor, the roots are high in vitamin C.
Plant at corners of a potato patch to deter potato bug. 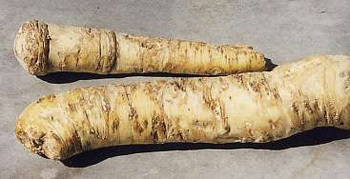 Only undried (fresh or bottled) horseradish is effective. The root can be preserved fresh for months in a refrigerator or packed in damp sand and kept in a cool place. Vinegar: cover finely grated horseradish with vinegar and let stand for 10 days. Take 1 tsp., 2-3 times a day, well diluted with water. This can also be applied externally. Poultice: spread fresh, grated root on a linen cloth. Lay on the affected area, with cloth against the skin, until a burning sensation is felt. Syrup: steep 1 tsp. root in 1/2 cup boiling water in a covered pot for 2 hours. Strain and add sugar until a syrupy consistency is reached. Horseradish taken in any form can be made more palatable with sugar or honey. Do not take large quantities of horseradish at one time. Stop taking it if diarrhea, vomiting, or night sweating occurs. The fiery taste of horseradish would deter any large doses normally. It is best to use the fresh herb if it is available.